Audi S3 Cabriolet pricing announced | What Car? Official pricing and equipment levels for the new Audi S3 Cabriolet and A3 TDI Cabriolet have been revealed, ahead of first UK deliveries scheduled for September this year. 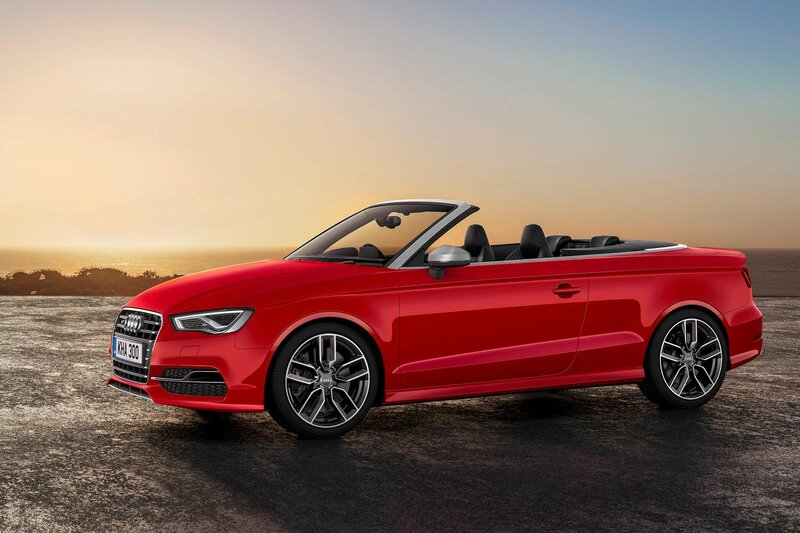 Audi has bolstered its A3 cabriolet range with the addition of two all-wheel-drive variants: a range-topping S3 Cabriolet and a more powerful diesel. This will be the first time that Audi has offered its all-wheel-drive system on the convertible version of the A3. The Audi A3 Cabriolet is the current What Car? 2014 Open-top Car of the Year. In terms of price, the S3 rivals the BMW 435i, which offers more space but slightly less performance. Two forthcoming you may also want to consider are the new Mercedes C-Class convertible and the BMW 2 Series convertible. Both are expect to be launched within the next 18 months. Two new engines are available. The most powerful version, fitted to the S3, is a 296bhp 2.0-litre TFSI turbo, which offers a Government combined economy figure of 39.8mpg and produces 165 g/km of CO2. The second, a 182bhp 2.0-litre TDI diesel, is capable of returning a combined economy figure of 56.5mpg and emits 132 g/km of CO2 when fitted with the S-tronic DSG automatic transmission. Traditional 'S' styling cues such as aluminium-finish door mirror casings, sculpted front bumper and a rear diffuser incorporating signature twin-exhausts are combined with xenon headlights, LED daytime running lights, 19-inch twin-spoke alloy wheels and black brake calipers complete with S3 logos. Inside, the S3 features a leather covered multi-function steering wheel, stainless steel pedals, unique dials including a boost gauge and heated sports seats finished in nappa leather with contrasting silver stitching. The less powerful A3 TDI quattro will include 17-inch alloy wheels, Audi Drive Select, sports seats and aluminium interior trim. Sports suspension, which lowers the ride height by 15mm, is also standard, although a comfort option will be offered at no extra cost. The price for the S3 Cabriolet with S-tronic transmission is £38,910, while the A3 Cabriolet TDI quattro starts at £31,885, rising to £34,924 with the addition of the six-speed S-tronic ’box. Not at the moment, but that's likely to change towards the end of 2014. Keep an eye on the What Car? Target Price.